“I can’t get around this work that I’m doing, whether paid or for free. It’s been something that’s been a part of who I am for quite some time now,” Blondel told Bklyner in early March. 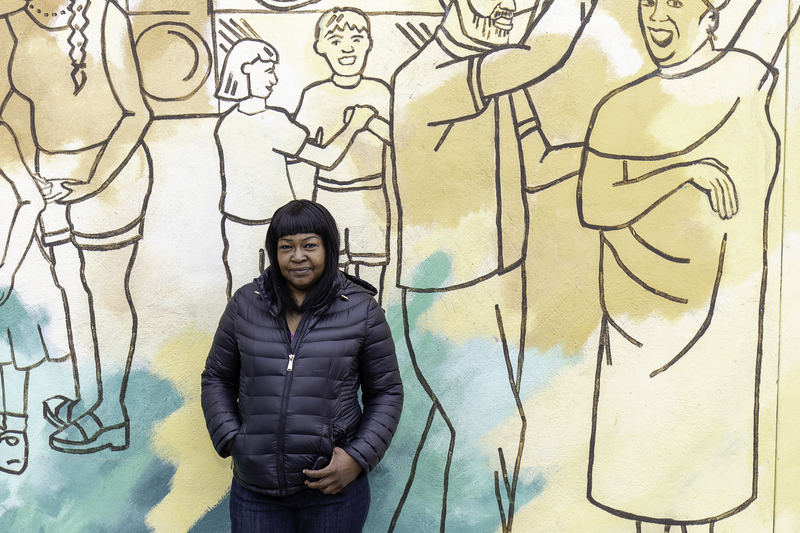 A longtime resident of the Red Hook Houses, Blondel has been fighting for the rights of NYCHA residents for decades. Blondel was born in Coney Island in 1963. Her mother moved with her and Blondel’s two older brothers to Brownsville shortly after. Her mother was diagnosed with multiple sclerosis when Blondel was eight. At 14 she was sent to Coney Island to live with her Aunt Rose, a civil rights activist, at the Carey Gardens housing development while her brothers moved in with another aunt. A year later, her mother suffered a heart attack and died at the age of 36. Blondel’s father, who had remarried and started a second family on Coney Island, died of an overdose in 1982, a victim of the heroin epidemic at the time. “I was 17…I felt this anxiety that my mother was gone. I needed to find my place,” she explained. “I also felt distracted in New York and I found this brochure for Job Corps…. I was trying my best to find my place, so when I saw it, I was like ‘Oh wow, this is like college. I want to go.’” She explains that it wasn’t until she arrived in Utah in 1980 that she realized the “vocational and academic training model started by the Mormon church” was for troubled teens. “When I got off the plane, there were hundreds of Bloods and Crips,” she recalled. After earning her GED, Blondel “got a little homesick” and returned to Coney Island, took the U.S. Navy exam, passed it, then became pregnant. She decided to forgo the Navy for motherhood. Blondel, 56, has two adult children, Freddy and Sade, and four grandchildren. When Blondel first moved to the Red Hook Houses, she lived in a one-bedroom apartment on Lorraine Street. After her daughter was born, she moved to a ground-floor two-bedroom on Columbia Street where she still is today. “I became the protector of the building,” she remembers. “I bought a water hose and stuck it out the kitchen window and I filled up a Barbie pool for my daughter. I had a barbecue for the whole block.” Blondel began cleaning the stoop regularly, taught the kids in the building to pick up after themselves, and planted a garden with her neighbors. “This is what started that community feeling on the block,” she said. Blondel recalled an incident in 1992 that was the impetus for change in Red Hook—the death of Principal Patrick Daly. “That was huge. He was a well-known, well-liked principal in the area,” she explained. Daly, the longtime principal of P.S. 15 on Sullivan Street, was out searching for a student when he was caught in a crossfire and killed. “It takes some big issue like a principal getting shot [before] local government starts saying ‘we need to do something for that area,’” Blondel said. “What came out of the shooting was AmeriCorps.” The federal volunteer program was introduced to the neighborhood in 1994 to address conflict resolution, mediation, and community building, she said. “I started reading what the job descriptions were for board members and I didn’t see that happening, so I was like, ‘this is where I can come in and stop them from voting for someone just based on friendship, cronyism, nepotism, get someone as a secretary who’s willing to take good notes, have a treasurer who won’t steal your money, and have a president who understands that it’s not a dictatorship….’” Blondel has unsuccessfully run for president of her Tenants Association three times. 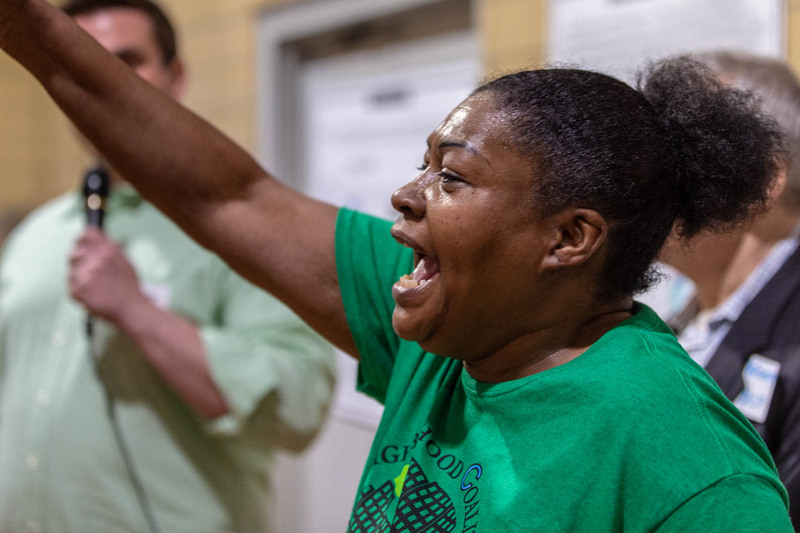 She suggests that public housing residents stand up against the mismanagement. “They have to organize. They have to understand and read the bylaws and enforce the bylaws in the meetings. If nobody’s giving you the minutes to the last meeting, then the meeting should not go further. If you’re not getting financial reports, the meeting should not go further,” she insists. Blondel adds that neighbors can also form their own association per a HUD [Housing & Urban Development] mandate stating that public housing residents can have more than one resident association, though only the NYCHA-appointed council will receive funding—$25 per unit per year, she said. When she tried posting this information at Gowanus Houses and Wyckoff Gardens, those Tenant Association presidents told her she needed approval from the management office. 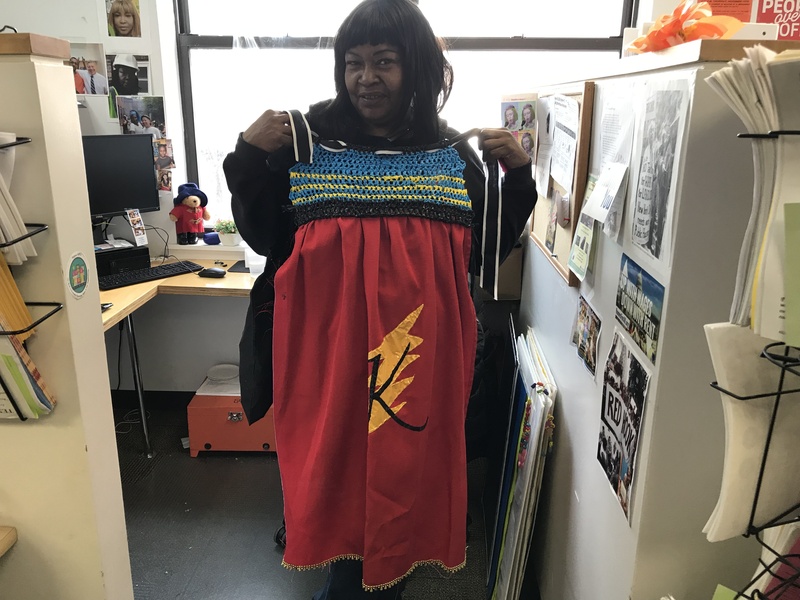 About a year and a half ago Blondel began holding “Know Your Rights” workshops for public housing residents in Red Hook, telling them about the bylaws and the Tenant Participation Activities Guidebook. One topic she discusses is the AMI (Annual Median Income) requirement under the Mandatory Inclusionary Housing (MIH) program so public housing residents can determine if they are eligible to apply to new affordable housing developments. She also alerts those who have applied to public housing that their applications are only valid for two years and that they will need to re-apply after those two years have lapsed. Most applicants are not aware of the expiration date, she said. Blondel notes NYCHA did recently take a step in the right direction by including a note with monthly rent statements about recent updates to the resident guidelines. 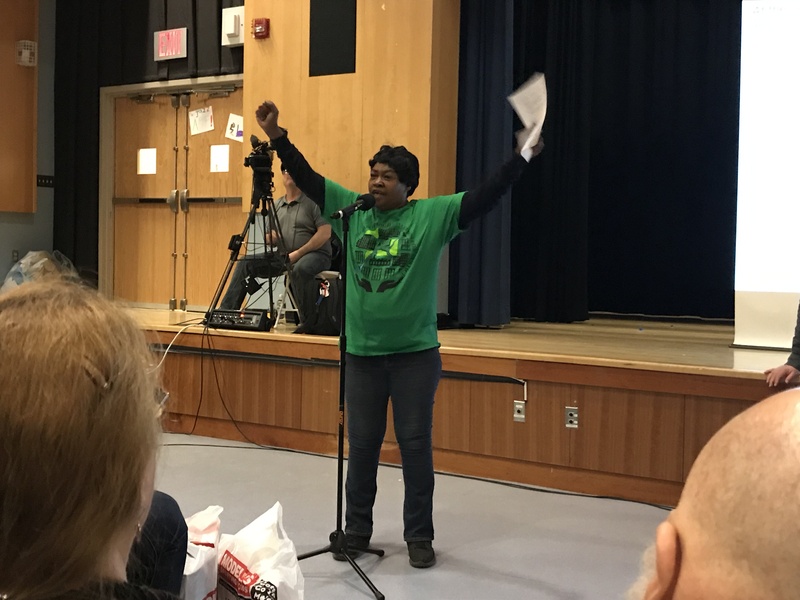 The “Know Your Rights” workshops for public housing residents soon became part of Blondel’s full-time job at the Fifth Avenue Committee (FAC) and expanded to a “Know Your Rights” program for rent-stabilized and rent-controlled tenants as well. Blondel currently works for FAC as an organizer for the Turning the Tide Environmental Initiative. Over the years, Blondel has worked in several jobs where she gained the knowledge and experience necessary for this role, including as an engineer’s assistant inspecting construction sites and developing blueprints for bridges, highways, and utility maps. “I learned a lot about manholes and sewer lines,” she said—experience that would later aid her in her work with the Gowanus Canal Superfund project. “I didn’t particularly ask to do this, but I think I’m capable of doing this, and when I look at my strange background…I say ‘Wow. I learned everything that we actually need in a liaison for what’s happening here with public housing and with rezoning,” she noted. It was also during her time at Gandhi Engineering that Blondel learned about the $550 million allotted to Red Hook for post-Sandy recovery. Excited by the news and the opportunities the funding would present to her neighbors, Blondel immediately took action. “I knew what that meant in terms of Section 3 hires, but they were stationing the outreach in Coney Island and I felt with Coney Island having all of those public housing clusters that they were going to utilize their energy and resources there first and by the time it got to Red Hook we wouldn’t get s–t,” she explained. Section 3 is a HUD mandate stating that any construction project with a budget over $250,000 must hire public housing residents or low-income individuals. It was during this outreach that Sabine Aronowsky of FAC asked Blondel to consider a position at the non-profit. “I took the job as a way and a means to work close to my community because I wanted to see what $550 million—a once in a lifetime opportunity for Red Hook—could actually do. And having a background in engineering, I wanted to see it and have a say,” said Blondel. The Turning the Tide Initiative was originally intended to educate public housing residents about the environmental burdens they face living near the lowlands, sewer sheds, brownfields, and the waterfront, she explained. “I was hired to really talk about the Superfund cleanup and the fact that the city and EPA were proposing two tanks.” One of the tanks, an 8 million gallon combined sewage overflow, is planned for the head of the canal, not far from the Gowanus Houses and Wyckoff Gardens. Blondel is all too familiar with the problems in the NYCHA apartments. After finding water in her electrical outlets last year, workers “took the sink off of the wall in the bathroom and left it on the floor for nine months. They took out my walls in my shower and put up a plastic sheet for several months,” she said. Despite the tough exterior she exudes when protesting, Blondel is actually very warm and lighthearted, endearing herself even to those she confronts. 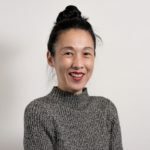 See her in action as she continues to advocate for public housing residents throughout the Gowanus rezoning process and tackle other issues affecting Gowanus and Red Hook. Karen is a force! Here’s her in action at the DCP meeting that is referenced in the well-deserved profile.